Thanks for considering cloth. I feel, from the bottom of my heart, that it’s the most important thing we can do for our the health of our planet as parents. This note is a work in progress, and please let me know if anything is unclear, if you still have questions I failed to address, or I can be of any further help! WHY CLOTH: This is the easiest question to answer! I will start by describing my diaper stash. I have 17 cloth diapers, and ~24 cloth wipes. I got through the entire 1st year of babe’s life with 10 diapers. They are made in China (one of the ONLY times you’ll see me condoning made in China). Being on a very tight budget, I was scared of the price involved in cloth diapering, afterall, I didn’t know if I’d like it, but wanted to give it an honest try. They’re available brand new on Ebay 10/$50, shipped to your door from China. I read lots of reviews, and many were positive so I thought I’d give it a try. I was very skeptical, hubby & I both thought the snaps would be falling off left & right. I have to say, I’ve been very impressed with how they’ve held up. In 22 months of daily use, not one single snap has fallen off the 10 diapers. I launched this page shortly before my babe’s 1st birthday, and since then have added to my stash with mainly made in the USA diapers. I purchased 4 Tiny Tush Elites (@$25 ea) which we use overnight, 1 Bumgenius that I bought 2nd hand that is US made, but they are made both in the US & Egypt, and I’ve been told there’s no way to ensure you’ll get a US made one ($10), 1 Softbums w/ snap-in inserts that was sent to me in error, but I had already washed it so got to keep it, and 1 Flip w/ 3 inserts that I also bought 2nd hand ($8, made in Egypt). So, I’ve tried most of the different styles available. Without a doubt, the one-size pocket diapers are my favorite. Both the snap-in, and lay-in (Flip) are nice in that you just change the insert & reuse the shell. This works great when you’re just dealing with pee, but every time my babe goes poo in one of these diapers, it always gets on the shell, defeating the purpose in my opinion. I think the pocket diapers are the best diaper for beginners! I’ve timed it, and it took me 5 minutes to stuff my entire clean stash. They also dry very quickly on the line, where as the all-in-ones are thicker & take quite a bit of time to dry, from what I’ve read (haven’t tried them). You can use any washcloth, or even make your own from old cotton or flannel shirts or sheets. *****There are many, many more options for made in the USA diapers, which makes me very happy. However, all the choices can be very overwhelming if you’re new to cloth diapering & trying to just get started. Here are more links for you to check out with tons of options! Diaper Pail– A small, plastic trash can is all you need, preferably one with a lever to step on to raise the lid, so you don’t have to mess with the lid while you have your hands full with a diaper. The most important thing to know about detergent is it has to be free & clear, otherwise you’ll have buildup problems. I use soap nuts– to read more on them check out this note:https://www.facebook.com/notes/eco-friendly-babyfamily-products-made-in-the-usa/truly-natural-laundry-solutions-soap-nuts-wool-dryer-balls/556789574336687. I’ve read lots of differing advice on washing diapers, wherever you purchase your diapers from will have advice for you. Here’s what I do. I wash them every other day, or when the pail starts stinking. With the soap nuts, I do just a hot wash. That’s it. Some do a cold wash 1st, but with a diaper sprayer all solids are washed off, and I’ve found the cold prewash unnecessary. They come out looking & smelling clean with just the one hot wash with the soap nuts, which I’m IN LOVE WITH! 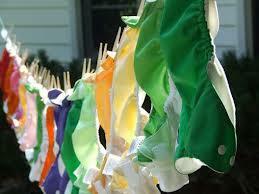 Then I hang them on the line to dry in the sun, or put them in the dryer with my dryer balls on low heat.